WAKA and Yuki – W&Y HAIR COLLECTION 2010 is coming up !! It’s our great pleasure to inform you that we are going to have a fashion show ‘AGATA Model Agency Presents W&Y HAIR COLLECTION 2010’. We are proudly announcing 10 brand new creations in the show ! In addition we are preparing a special souvenir “W&Y HAIR COLLECTION 2010 LIMITED TIME ONLY GIFT” exclusively to visitors coming to this show. We are going to set out this souvenir as a token of our sincere appreciation for your joining us today. This souvenir hairstyle will only be available for one hour after this show. After this time it will be removed. Please come in low ARC ( Avatar Rendering Cost ) outfits and remove all attachments such as AO, face light, scripted items and so on to reduce lag as much as possible and to help models to walk easier on runway and show you the beauty of hair. We hope to see many of you. 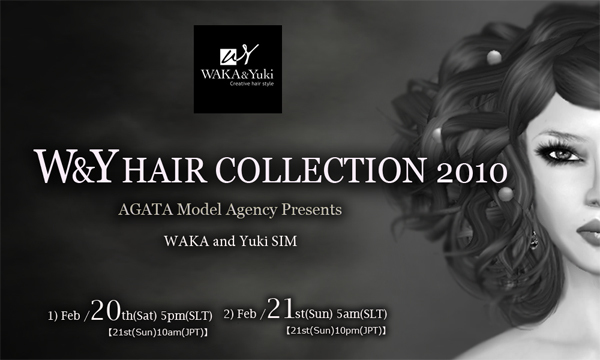 WAKA and Yuki – W&Y HAIR COLLECTION 2010 is coming up ! It’s our great pleasure to inform you that we are going to have a fashion show ‘W&Y HAIR COLLECTION 2010’. We would like to take this opportunity to welcome you to WAKA and Yuki and thank you for coming. Let me intoduce opening gifts again. We released 1L$ W&Y SIM OPEN GIFTs. These are some of OPEN GIFTs ! And we picked several items from all the products of WAKA and Yuki and brought the price down to 1L$ each. Please find them all ! CLUE :There are 10 items offered at 1L$ !!. The sales price is available until 2010.02.17 7AM SLT !! Please be sure to grab all items ! WAKA and Yuki SIM just opened ! WAKA and Yuki SIM has just been opened ! We’re very proud of WAKA and Yuki SIM grand opening today and very athrill with the unveiling of the great work built by Setsuna Infinity, genius for architecture. Thank you so much for a great work. We really appreciate it. We have released 1L$ W&Y SIM OPEN GIFTs and it will run until Feb. 16th, 2010. Please be sure to get them all ! We look forward to your shopping with us. We are open ! Attention, all of WAKA and Yuki customers. We’re very proud of WAKA and Yuki SIM grand opening on February 13th 15:00 SLT. All the building will be available on this day. Moreover we are very athrill with the unveiling of the great work built by Setsuna Infinity, genius for architecture. Simply wonderful, everything at the new main store has been changed from the Tsukiji store. 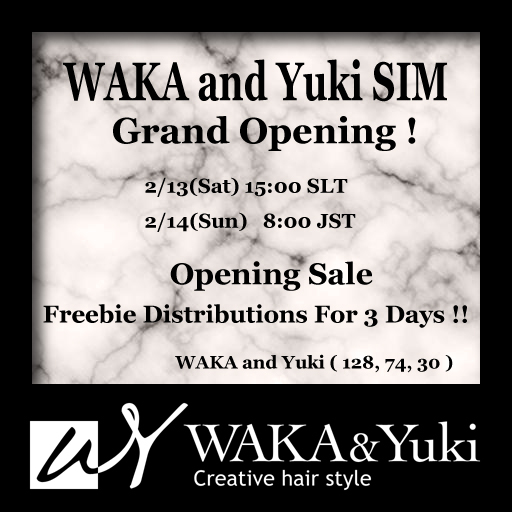 We will release 1L$ W&Y SIM OPEN GIFTs for 3 days from the opening day at WAKA and Yuki SIM. Please be sure to get them all ! We’re going to release 10 new hairstyles and a gift. Please check out WAKA and Yuki blog ! The URL above will be available on Feb. 13th. Hello , this is yukitan . How are you doing today? Attention to all members of W&Y, a group gift from WAKA ! We offer W&Y NEW HAIR 119 KDC version ( 1color – camel ) for 1L$ at KDC HAIR MALL. Colors modifiable W&Y NEW HAIR 119 is on sale both at main store and KDC HAIR MALL. Please grab this stuff at main store in Waka and Yuki SIM,. Don’t forget to show your group tag and click on the vendor to get this stuff. If you are not a member of our group, please join us by clicking on the board that shows ‘join group’.